Netsian is One of the Safest Electrical Contractors in the Country. Safety is an integral component of our culture: we have earned a reputation for our proactive approach and high standards and it shows in our impressively low EMR of: 0.49 Best in Class. 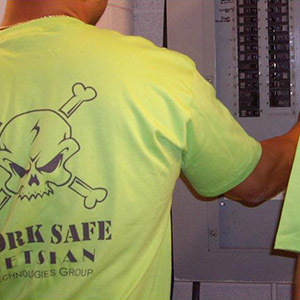 That makes us one of the safest electrical contractors in the nation. Ensuring safety on all projects is the most important thing we do for our employees, clients, subcontractors, and the community. By maintaining an industry-leading safety program with little to no work related injuries, we ensure everyone returns home safely to their loved ones each night. It's partly because we're an employee-owned company where family is a key element, and employees are viewed as our greatest and most valuable asset. We emphasize safety, because simply, it's the right thing to do. As a result, Netsian Technologies Group has been recognized by the National ABC with the Diamond Step Safety Award. The Diamond level award is the most prestigious safety award offered by the ABC. Applicants must meet rigorous standards to be considered, such as having a Total Recordable Incident Rate of less than 50% of the NAICS average as well as an E-mod of 0.7 or below. At Netsian Technologies Group, our safety metrics are reviewed formally on a quarterly basis in a group meeting, by our COO, all Division Managers, Superintendents, and the Safety Department. In a subsequent meeting, our Safety Committee, reviews the quarterly metrics, disseminates the information to foremen and all other supervisory personnel assigned to worksites. Immediately following each meeting we generate corrective action plans, if necessary, and issue them to supervisory personnel whose division specific safety metrics are trending below our standard of excellence. Our approach to measuring the effectiveness of our safety program is aggressive and proactive, and as a result, it enables us to objectively demonstrate that we will continue to keep our family of employees safe from harm. As we continue to work tirelessly and execute the detailed planning required to maintain a resilient safety culture, it is clear that we will take the necessary measures to keep our work family safe from workplace hazards. Our team is driven by the cost benefits tied to accident prevention. One of the advantages of being an employee-owned company, is that we are eager to do our part to maintain the highest quality workmanship, while welcoming all opportunities to reduce the cost of insurance premiums, increase the bottom line, and ultimately grow the value of our company. Netsian Technologies Group continues to maintain an unwavering focus and disciplined commitment to provide a successful, accident-free, and healthy place to work. We strive to not only be the safest electrical contracting company in America, but to improve our safety numbers every single year. The results only motivate us to push even harder. Our experience modifier (EMR) has produced a credit on our workers' compensation insurance premium for years.